I’ve heard reports from numerous citizens that attended Tari’s “Open House” Friday night. Tari claimed the City is suing the Coliseum. Meanwhile, Alderman Hauman is telling citizens the new CIAM contract will look much different. Maybe Tari is trying to pass off my lawsuit as his own. Tari? Evidently Tari and the majority of the council are clueless. The Coliseum could be managed much better by professionals. Below is some information citizens most likely don’t know. 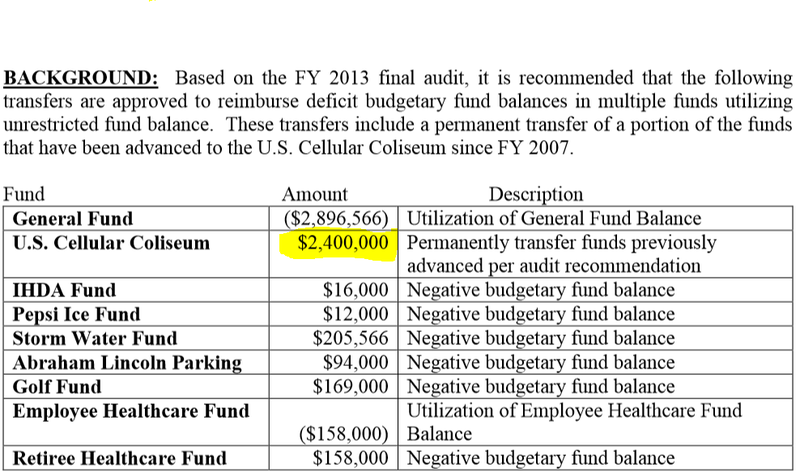 First, citizens probably don’t know the Coliseum got $2,400,000 in 2007 to cover expenses. In other words, the Coliseum really cost $2.4 million more than citizens were told. Second, looking at this chart, the council must have thought the write off of $2.4 million was money the General Fund had loaned to the Coliseum. It wasn’t. This note is from the FY 2013 financial statements. It obviously shows the $2.4 Million came from the Water Fund, not the General Fund. Aren’t you thrilled the money you pay for water is diverted to other projects? http://www.cityblm.org/Modules/ShowDocument.aspx?documentid=5910 Page 91. 2011 does show a different loan to the Coliseum for $2,450,000, but not from the Water Fund. I don’t know if the $2,450,000 was ever paid back, unlikely since the Coliseum doesn’t make a profit. Have any loans from the Water Fund been paid back, or is this fund the City’s spare piggy bank? Don’t know, but I’m looking. Audited financial statements show the Coliseum has lost MILLIONS of dollars since it opened. How much money has the City given to CIAM to cover the losses? I don’t know, but I’m looking. The City has obviously given CIAM your money to cover the losses. How is the Coliseum doing since May 1st, 2015? Stay tuned – I received CIAM’s statements by FOIA. Coming up next. Posted in BloNo, Bloomington, Hales, Local, Progressives, Renner, Taxes.Tagged Coliseum, Tari Renner, Transfers, Water Fund. The bond repayment for the Coliseum is a sunk cost. What we need to do is stop the operative expense hemorrhaging. How about a petition to put an initiative on the ballot to force the City of Bloomington to sell or implode this tax sucking monster. They could close it and use the part of 1/4% sales tax they have been using to pay the bonds. Decades from now when it’s paid off, they can tear it down. Or maybe it could become a homeless shelter. Unflippin-believable the crap that city management gets away with,,,for now! Hales makes Hamilton look like an amateur.